I want to start off by giving you a huge heart felt thank you for keeping my business "Up & Running" Never have l experienced a more personalized professional service in assisting us in getting our computers repaired and running like brand new from any IT company before. I was very amazed at how quickly a technician responded to our service call. I felt like VIP. Jacob assisted via remote desktop to remedy 2 of my most used and extremely important computer ridding it of a malicious malware. Most recently our office experienced a power surge that rendered our host sewer computer for our paperless virtual file cabinet inaccessible. Jacob personally drove all the way from Corona to Anaheim to pick up the injured tower and take it back to the Up & Running operating table. We had over 5 years of data and files stored on that computer without a recent back up. We were anxiously awaiting news. Up & Running worked their magic and were able to recover the files install a new hard drive and get us back in business within 48 hours - really 24 hours if we exclude the weekend. John was in the office Monday morning bright and early to deliver the computer. He took the time test run the repaired computer making sure we were completely satisfied. In a day in age of paperless files and electronic insurance applications it would be impossible to conduct business without the use of our computers and my business would crumble. Up & Running was fast, professional and made me feel as if they are an extension of my team. Thank you once again Up & Running! "Up and Running has been and continues to be a valuable resource for us here at SHOCKWAVE CUSTOM BOATS. Up and Running not only has provided excellent technical support for our company, but is also very instrumental in the design and maintenance of our website." "Up and Running has serviced my website for 10 years. Their team not only created a design that complimented my business, but they continue to manage and update it with exceptional care. The compliments I recieved from my collegues and clients says it all." 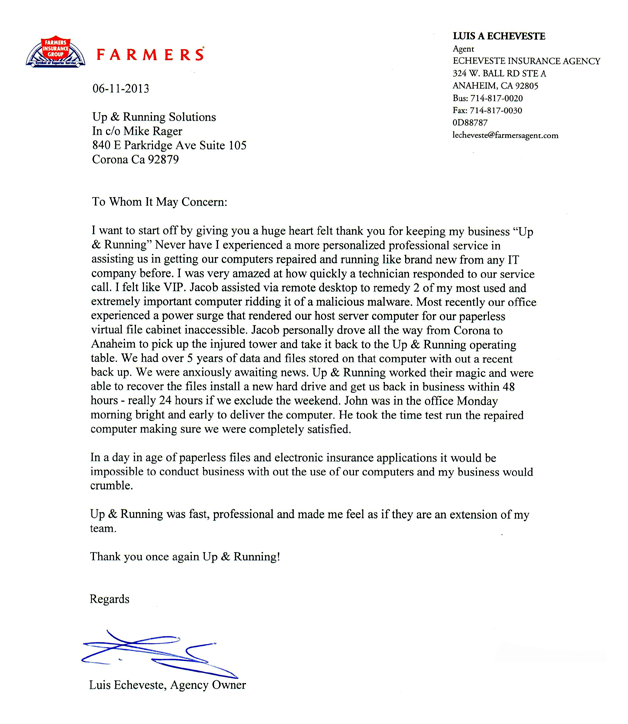 "Up and Running has provided quick turnaround service, not only for my I.T. needs, but for our website updates. I know I can always count on them to be responsive and professional." "Quick service appointments are critical for our industry, and Up and Running Takes the extra step in making sure we have little to no down time." "I love having peace of mind knowing that my systems are monitored and I won't have any surprises."